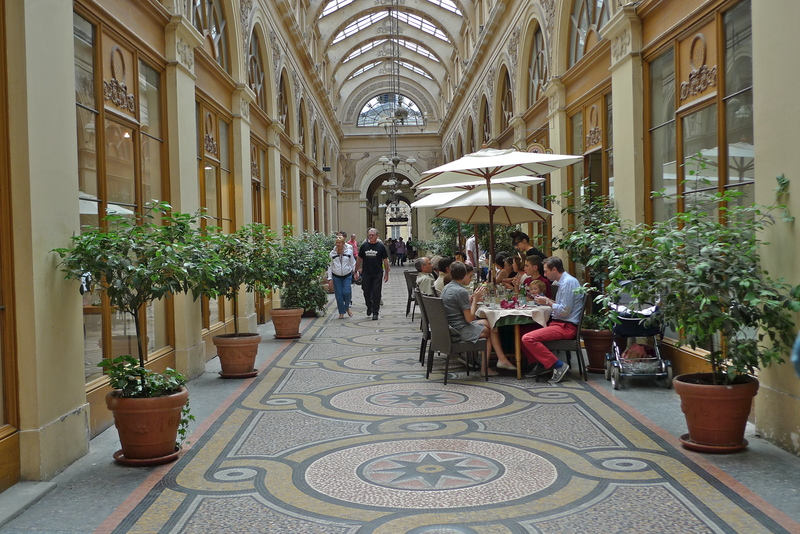 I’VE SET MYSELF the task of recording the sounds inside each of the surviving passages couverts in Paris and I will feature a series of them on this blog in the weeks to come. 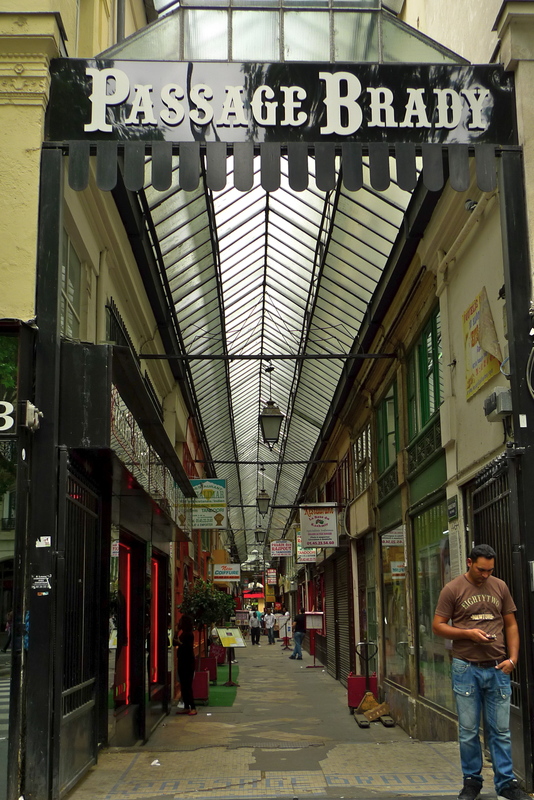 Altogether, one hundred and fifty of these covered arcades were built mainly in two bursts of activity – from 1823 to 1828 and from 1839 to 1847. Of these one hundred and fifty, just twenty remain today. The passages couverts were concentrated on the right bank of la Seine, an area more associated with commerce than the left bank. The most glamorous and most fashionable such as the Galerie Vivienne (perhaps the most elegant of them all) were concentrated in the area around the Palais Royal, the Boulevard des Italiens and the Boulevard Montmartre. All these passages faced in a north-south direction. 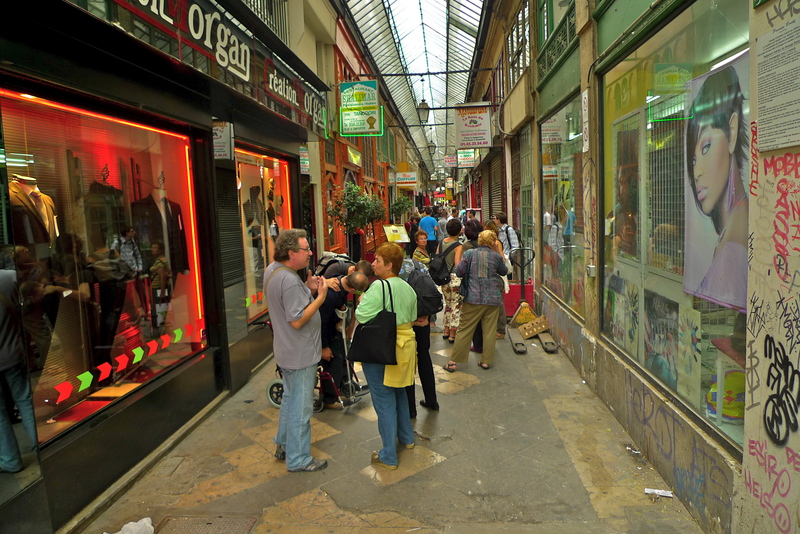 By contrast, another cluster of passages couverts, all in an east-west configuration, sprang up in the area around Saint-Denis. These were much less glamorous (save for the Passage du Grand-Cerf perhaps) and far less fashionable. I’ll feature the Galerie Vivienne and the Passage du Grand-Cerf later in this series but for this post, I want to feature a passage from the other end of the spectrum. 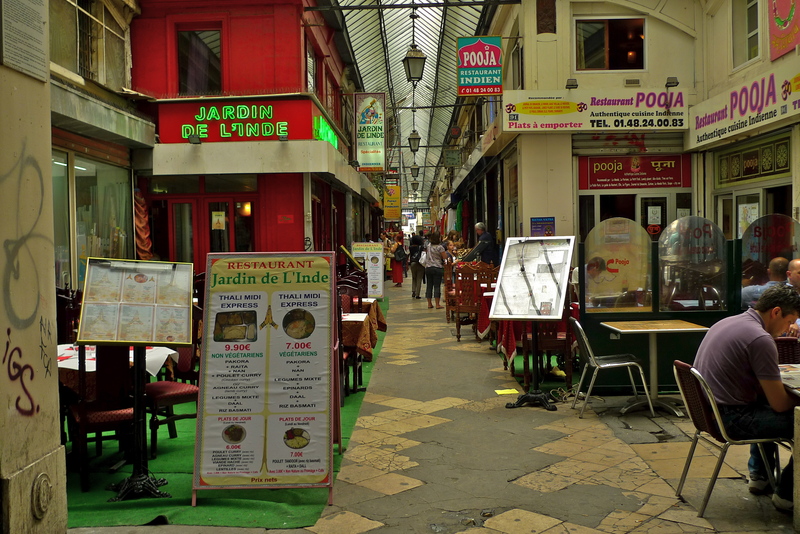 Close to Porte Saint-Denis is the Passage Brady and one could be forgiven for thinking that this is not in Paris at all. Opened on 15th April 1828, the Passage Brady today is an oriental delight. With its exotic smells and the atmosphere of an Indian bazaar, the chipped floors, ailing glass roof and peeling, graffiti-adorned walls somehow don’t seem to matter. Indian immigrants first came here in the early 1970’s from Pondicherry, a former French territory in India and later, immigrants from Pakistan and Bangladesh joined them. The food, exotic spices, clothes, trinkets and even the hairdressers reflect this cultural mélange. A shopkeeper and entrepreneur, perhaps not surprisingly called Brady, conceived the idea for the Passage Brady. 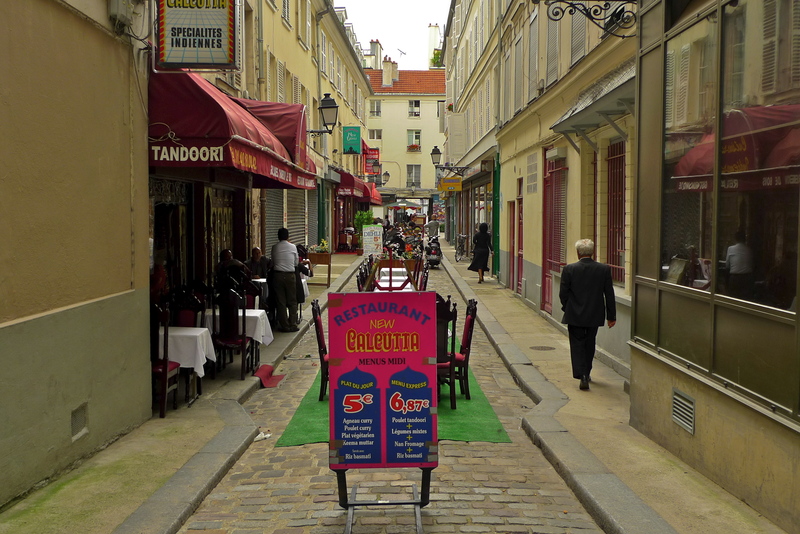 His idea was to create one of the longest passage couverts in Paris comprising one hundred and thirteen shops with housing above. And he would have succeeded had it not been for Baron Haussmann’s city planning. Originally, the Passage Brady had a large glass dome at its centre before continuing further to the east as an uncovered passage. The main entrance was under the glass dome. In 1854, the new Boulevard Sévastopol was under construction and the glass dome suffered as a consequence. This new road cut right through the Passage Brady taking the dome with it. Today, the covered Passage Brady lies to the west of the Boulevard Sévastopol with the uncovered part to the east. 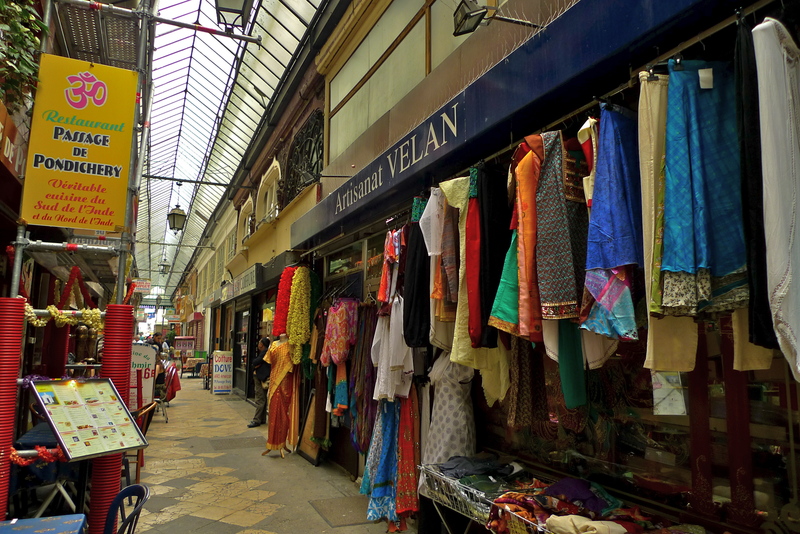 The Passage Brady may not be the most elegant of les passages couverts, perhaps not elegant at all, but the smell of exotic spices and incense, the colours and the sounds seem to capture the essence of the original passages couverts. To see more of les passage couverts take a look at this piece.